People across Africa are ready to pay for development. A UN poll shows that no matter where you live, citizens rank having “an honest and responsive government” among their top five priorities. Afrobarometer is a great organisation that asks more detailed questions of citizens in African countries, providing unique insights and country-specific polling data – something we really can’t get anywhere else at the moment. Their findings can help us understand what is most important to citizens in developing countries, and how we can ensure those needs are part of our transparency agenda. This issue is no stranger to ONE. Last year, 135,000 ONE members called on world leaders to make sure that the next set of poverty-busting goals reflect the opinions and priorities of people living in poverty through our Open for Development campaign. 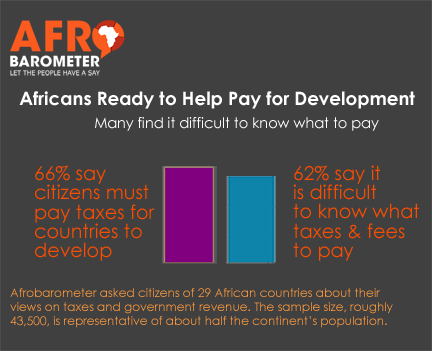 Africans are ready to help pay for development – 66% say citizens must pay taxes for countries to develop. 1 in 3 African citizens say ‘most’ or ‘all’ tax officials are corrupt. 76% of African Citizens say it is difficult to find out how governments use tax revenue. Here’s how the individual countries stack up. It’s important that governments know what their citizens’ priorities are, and in an ideal world, use results like these to influence policy change in those countries. This data shows that citizens are willing to pay for their own development through taxes. However, when citizens don’t have data about how much their country is collecting in taxes, and how that revenue is spent, it’s very difficult to combat corruption. That’s why we need to keep working for transparency of resource flows, so citizens can better hold their governments accountable for delivering the services they want and need. From picking priority areas to opening up country budgets to ensuring income from oil, gas and mining are used for development, there is an urgent need for greater transparency. Corruption has a damaging impact on the economies of African nations, and much more information is needed to stop it. That’s why ONE is lobbying EU leaders to crack down on phantom firms that rob Africa of much-needed resources by making it easy for money to be siphoned away from developing countries. If information about who owns companies and trusts is made public, it will be easier for people to follow the money and stop corruption in its tracks. Join thousands of ONE members and tell European leaders to crack down on phantom firms.